Location: Augusta Spa is situated in an ecologically clean area, with peaceful and quiet atmosphere and fresh air. Hissar is known for its beautiful nature and landscapes, archeological spots of interest and of course, the moneral water springs. 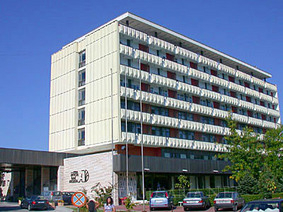 Accommodation: Augusta Spa Hotel is a three star hotel. Ot offers 560 beds in double and single rooms and suites – all with balconies and baths. The capacity of the hotel is 160 rooms including 65 singles, 70 doubles, 10 connected rooms, 5 family rooms, 5 two-bedroom suites and 4 one-bedroom suites. Room Facilities: All rooms have balconies, PVC window frames, Internet connection, satellite TV, direct telephone line, air conditioning, fridge, modern furnishings, bathroom with bath-tub, telephone, hair dryer, individual heating.